Do you feel tired and exhausted and weigh at least 7 kg more than you used to? Your life is busy, you never seem to get a break so it seems like you can do very little about the fatigue and exhaustion but feel determined to at least do something about bringing down that weight. Somehow you manage to make room in your busy schedule for working out, and whilst you are at it, you are giving it your everything to burn as many calories as possible in the time you have. It makes you feel pumped up, you are proud of your achievement but then somehow you are overwhelmed by exhaustion again. You put your social life off to another day. To tackle the weight loss efforts from both ends, you may be conscious of your calorie intake too and sometimes make yourself stop eating before you feel fully satisfied. You know you are tired and exhausted. You may find yourself worry more than you used to, you have less patience with others and your thinking is less clear than in the past. 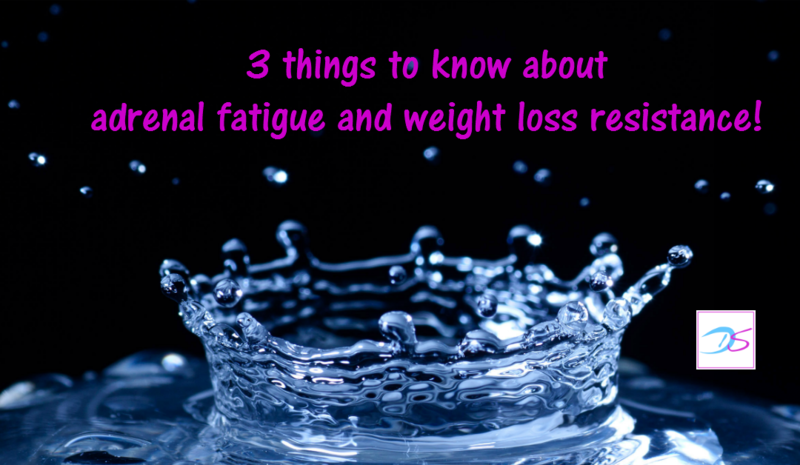 All of these symptoms can be signs for adrenal fatigue. Your life is busy, you hardly ever get a break, there may be other stressors in your life (real or perceived) that challenge your stress response. For example, going back to work after having a baby (especially with no family support at your doorstep), can trigger stress on various levels. When our body produces cortisol, our main stress hormone, it’s generally with the purpose to get more glucose into the blood for more muscle power to run or fight or to the brain for quicker decision making. The thing is that we don’t actually run or fight, so we are not using up the extra energy. Energy that’s not used gets stored as fat. When we give the body less calories than it needs the body will start to perceive this as a starvation period. Because the body doesn’t know if the famine will hit even harder the next day, it starts to down regulate the metabolism to conserve energy, in other words it will hold on to fat reserves and it will make you feel more tired. This can hit you twice as hard when your adrenals are fatigued. With adrenal fatigue exercise can also easily exceed the threshold of what the body perceives as stress. The Zumba class that used to be a “piece of cake” (in the lack of another expression), can now be the straw that breaks the camel’s back. When your adrenals are fatigued it’s important to eat more of the right things rather than restricting calorie intake and it’s just as important to adjust the intensity of exercise to a level that the body will not perceive as stressful. Swapping the Zumba class for a yoga or tai chi class may get you one step closer to losing extra weight. With adrenal fatigue eating more of the right things and toning down your exercise programme alone is not going to be enough to get better. It’s important to tackle the root cause: what are the things that happened in your life that led to adrenal fatigue in the first place. Generally it’s not one particular thing, stress is accumulative. Imagine that you have a stress collecting barrel and every time you experience stress (remember: real or perceived), a few buckets get poured into your barrel. You have a baby and your life pretty much gets turned upside down, you have sleepless nights, you may eat things your body doesn’t agree with, you are in disagreement with your partner on things about your baby, you are going back to work, there are things at the day care centre you are not happy with, your child is ill and it’s difficult to take a day off work and then your grandmother dies which was the bucket that had the barrel flow over. It wasn’t the death of your grandmother that pushed you over the top of the stress curve. With everything that happened before, there was no more room in the barrel. Tackling the root cause means becoming aware of the stressors, reducing the ones you can and adding relaxation and stress management tools to your life so you can handle stress better. There are many strategies to do this and the more personalised they are the more effective they will be.